The part of a drilling tool that holds the drill bit. A small tool to suit a particular drill chuck consisting of a bevel gear on a shaft with a sliding bar handle used to tighten and undo the chucks on drilling machines and electric drills. The two chucks below are both what are known as Three Jaw Chucks. They are the standard type of chuck made in many thousand for all sorts of drilling machines and power tools. 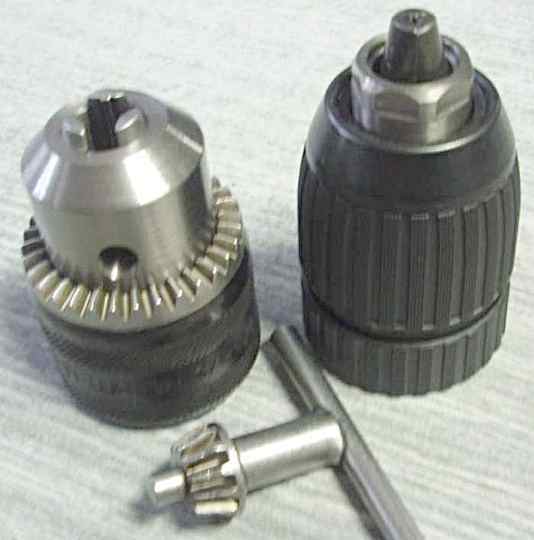 The chuck on the left is a standard chuck that is opened and locked using a Chuck Key The jaws of the chuck move in and out on a threaded inside ring controlled by the round outer gear. The chuck key is a small bevel gear on a shaft with a cross handle that meshes with the main gear when it is fitted into one of the holes around the edge. 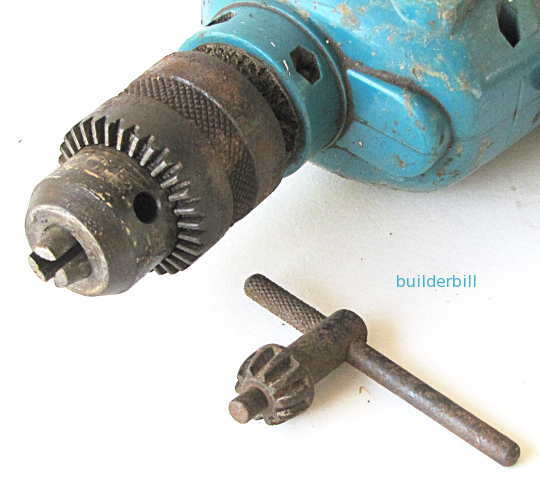 Drill Chuck : A 12mm drill chuck and key. The three jaw configuration is known as Self Centring which is a good enough description for the purpose of ordinary power drills and drill presses. They are near enough self centring for our purposes, but in precision engineering it is a different matter. For example a metal machinist might use three jaw chuck for non critical work but use a four jaw chuck when far greater accuracy is needed than what a three jaw with it's automatic centring can give, It is all a matter of how fine the measurements are. For a different reason entirely, large hammer drills hold their drill bits in with proprietary chucks that allow free play and movement. The SDS-Plus system is probably the most common of these. Have a look at the rotary hammer drill page for more on these hard working chucks. The Keyless Chuck is all about convenience. They are fast and easy to undo and change bits. They are only seen in smaller sizes of drills and they are simply tightened by hand. That is one hand grips the chuck and the drill is given a burst on the trigger with the other hand. The working action is done by the drill itself turning against the hand grip on the outside of the chuck. Set the drill to reverse to undo and forward to tighten.